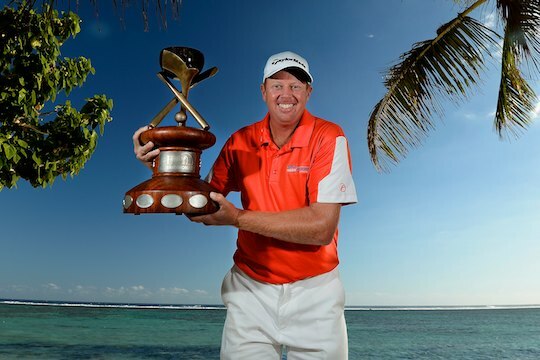 Australian Steven Jeffress has made history by becoming the inaugural winner of the Fiji International played at Natadola Bay Championship Golf Course. Hitting the very first tee shot of the Fiji International, Jeffress went onto sink the last putt of the tournament as he birdied the 18th hole to claim the title by four shots from fellow Australian Jake Higginbottom. “I’ve done the hard yards out here, I’ve been a Pro for a lot of years so it was nice to hit the first tee shot and the last putt and be the winner,” said Jeffress who finished with a tournament total of 10-under 278. With a career spanning 15 years this is the 38 year old’s most significant win to date and earns him a prize cheque of US$180,000. “This is the number one win of my career without a doubt and it is special. I am over the moon and a bit surprised,” added Jeffress. Jeffress and Higginbottom had started the day sharing the lead but at the turn it was Higginbottom who held a two shot advantage. However, the wheels started to come off for the young Australian when he bogeyed the 10th and the 13th. The turning point proved to be the par-3 15th, where the two frontrunners, arrived tied on seven under for the tournament. Higginbottom dumped a poor tee shot into a hazard well short of the green and although he was able to rescue a bogey with a remarkable chip in with his provisional from behind the green, Jeffress made birdie for a crucial two shot swing. A bogey on the ensuing hole by Higginbottom virtually handed the title to Jeffress, who had the comfort of a three shot lead with two to play. It was a lead he did not relinquish and which he embellished with a birdie on 18. “If you’d have said I would finish second at the start of the week I would have taken it. I played nice but Jeffo played unbelievable,” said Higginbottom, who won the 2012 New Zealand Open as an amateur. He hit a 52-degree wedge into the hazard on the 15th where he said he was put off by a distant cry from the nearby beach. Australians Terry Pilkadaris and Andrew Dodt tied for third eight behind the winner after rounds of 71 and 76 respectively. Fiji’s Vijay Singh, who designed the Natadola Bay course, finished off with a 73 to end in 10th place, on 2-over the card. “It was tough out there, tough putting, tough driving. It just doesn’t let up, there is so much trouble and you have to focus on every shot,” said Singh. Three-time Major winner Nick Price from Zimbabwe, aged 57, finished off a solid four rounds with a 75 to end in a tie for 35th place. The next event on the PGA Tour of Australasia is the Isuzu Queensland Open Championship at Brookwater Golf and Country Club from 28-31 August.